I remember always hearing about self-care & it being almost synonymous with over the top acts of relaxation, like spa reservations & exotic getaways, but as I’ve gotten older (and wiser) I’ve realized & accepted that that type of self-care isn’t everyone’s reality…and to be honest, it really isn’t self-care — you’re essentially telling yourself you only matter on certain days or occasions. Last holiday season, I made the decision to transform our bathroom to create our own spa like sanctuary so that both my husband and I could enjoy some relaxing downtime at home and any time we wanted. In my commitment to treat my husband & I to a lot more self-care, I realized we could make small changes in our home to create those experiences for ourselves. Upgrade your shower head for a moree luxe look & feel. There’s a reason most luxury boutique hotels use rain shower heads! Swapping out your shower head — which is way less expensive or complicated than it sounds — for one that is larger & gets better water pressure (especially if you’re a renter!) opens you up to more relaxing showers. Use candles & greenery to creating a soothing ambiance. The benefits of introducing plants, flowers, and candlelight into your space can definitely come in handy in your bathroom. Imagine how much more relaxed your shower or bath will feel by candlelight, even if it's flameless one. Declutter & get organized for a more visually soothing environment. Ever heard the saying, “a cluttered space leads to a cluttered mind”? 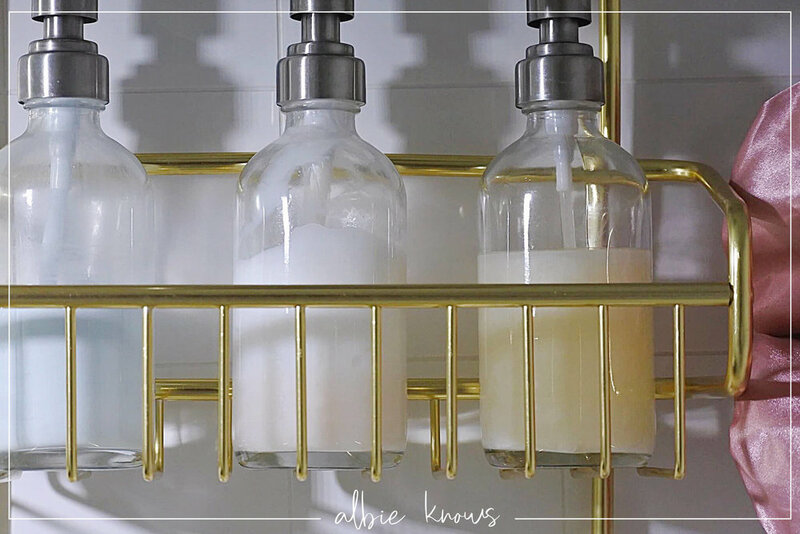 Personally, replacing our product bottles with glass and/or amber bottles for a more curated look on our shelves & counters is one of the things I love most about our bathroom! Even the most practical items, could be displayed in a way that’s super chic & spa-like — choosing to only use all white washcloths, I keep them individually rolled up in a basket, next to the tub, making them accessible for use, but also nice to look at. Play with scents, specifically scents associated with spas such as eucalyptus & lavender. Whether it’s to use essential oils in a bath or light a scented candle on the counter, those scents will undoubtedly trigger feelings of being in a spa. Alongside the updates to the bathroom I made updates to my routines. Actually, the new bathroom inspired the new routine, because no feels particularly relaxed or refreshed in a bathroom that feels dated & dingy. Once I was walking into a bathroom that had a more zen like feel to it, I felt compelled to want to tend to myself a little more too. As a mom, wife, and business owner, the juggle can take a toll on my skin, and I don’t always have time to dedicate an hour to self-care. 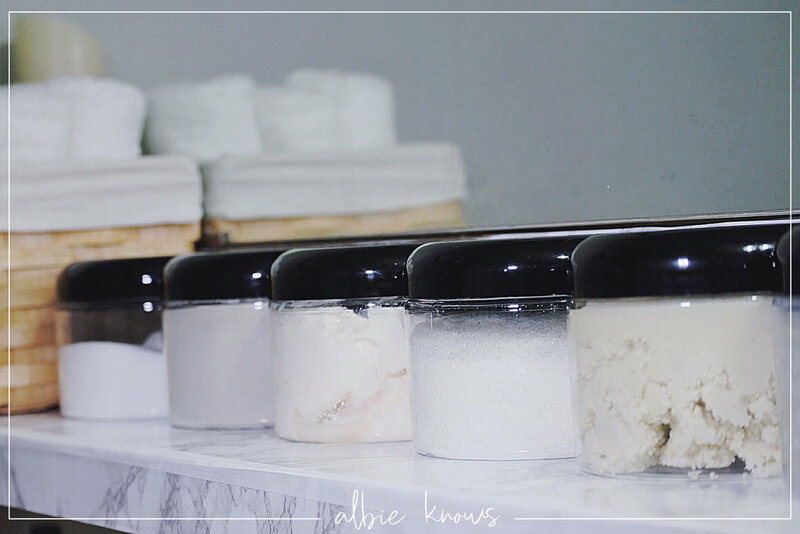 In my quest for effortless spa alternatives last year, I came across Patchology & I’ve been obsessed ever since. With my time often limited, I immediately gravitated towards their “5 Minute” products — FlashMasque® Illuminate 5 Minute Sheet Mask, FlashMasque® Hydrate 5 Minute Sheet Mask, Wink & A Kiss FlashPatch® 5 Minute Hydrogels, and Wink Wink FlashPatch® 5 Minute Hydrogels. Moving to the west coast started to change my skin & so the hydrating masks (which are my husband’s favorites, by the way!) have been super clutch for when my face feels especially dry & parched; while the illuminate masks have been my go to for nights when I get to soak & relax in the tub with wine & a good book. The flash patches have become regular parts of my morning and evening routines, especially the eye gels — my eyes can look awake, even when I’m not actually fully there myself. Setting aside, literally, 5 minutes of self-care has not only done wonders for my skin but also for my state of mind — it gives me a chance to just slow down & take a breath before diving into the day or crashing into bed. I’ve even gotten into the habit of bringing them with me when I travel, thanks to their On the Fly Kit — so convenient! I think we all could benefit from learning to "keep calm & spa on" and the same care that goes into the rest of the house — the same effort that goes into creating relaxing environments throughout the other areas — should be equally applied to the bathroom. It's actually probably one of the rooms in your home that could use it the most! As we get ready to round out yet another year — I still cant believe it’s been almost a year since my first bathroom upgrade, by the way — I’ve been considering giving our bathroom another quick refresh. I am absolutely obsessed with the Hygge spa experience that I’ve created for us — from the decor that evokes feelings of tranquility to the products that are part of our new self-care normal — and even in a rental, you'd be surprised at how transformative the right upgrades can be! Get creative...so long as it works for you.